Honda Radio iPod iPhone Interface with Auxiliary Audio Input. 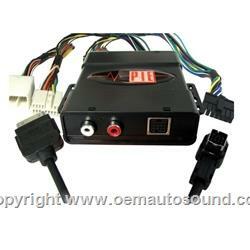 The hon03-pod/2 allows you to operate your iPod iPhone using the Honda Oem satellite radio controls. using this interface, the iPod will emulate the factory XM satellite system, providing you with one of the most interactive interactive OEM iPod interfaces in the industry. the hon03-pod/s also provides an additional auxiliary input. Individual search by artist, playlist, etc. Ability to display text fields. For Honda satellite ready vehicle. Must have a "XM" button.